Comedy Club Express is everything you love about The Comedy Club in a more accessible package, created specifically for smaller venues looking for a great night of entertainment on a budget. Along with a slimmed down service package, Comedy Club Express nights can offer this great value entertainment by using up and coming acts from the UK comedy circuit. Your Comedy Club venue could help unearth the next Michael McIntyre, Ross Noble or Stephen Merchant as so many have already done, so what are you waiting for...it’s time to bring laughter to life! 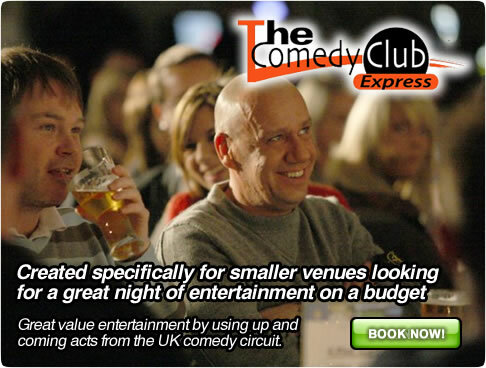 Comedy Club Express is part of The Comedy Club Ltd group of companies. The UK’s market leading comedy provider. Hold a Comedy Club Express night at your venue.